A generation ago, Los Cabos's twin cities of San Jose del Cabo and Cabo San Lucas were known only for sportfishing, not golf. How times have changed. Connected by a 19-mile corridor at the southern tip of Mexico's Baja Peninsula, the sun-drenched outposts still boast trophy anglers and their catch (marlin, dorado and yellowfin tuna), but equal billing now goes to the area's world-class links. With more than a dozen championship courses beckoning, and more on the way, Los Cabos is a big-time golf destination. Toss in a kick-off-your-shoes vibe and unique, desert-meets-the-sea setting, and it's hard to imagine a better place to flee February's chill. The Shark, the Golden Bear and DLIII have laid down some thrilling tracks here, courses with lots and lots of water that are definitely more fiesta than siesta. Two sublime kick-back spots beckon, one where A-listers romp and the other abutting Baja's most money course. From the Giggling Marlin to Squid Roe, Cabo San Lucas is legendary for its dining and drinking spots. 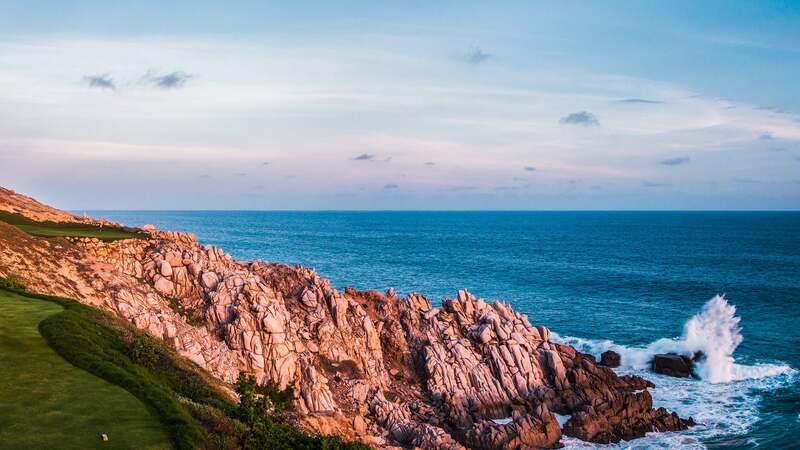 El Farallon, at the Resort at Pedregal, is a personal favorite, thanks to its locally caught seafood and eye-catching setting above the Pacific. GOLF contributor Josh Sens co-authored Sammy Hagar's Cabo Wabo 2015 cookbook, Are We Having Any Fun Yet? Here's Sens's take on the Red Rocker's favorite hang: "What began more than 30 years ago as a humble taco stand and tequila bar has grown into a concert venue and rollicking cantina. Along with bracing margaritas, highlights include Sammy's tequila shrimp, the shellfish flash-cooked with garlic and chiles and then splashed with lime and tequila. Live music also rocks here year-round, but at no time more than in mid-October, when Sammy celebrates his birthday with a bash that turns the whole town upside down." The best mini road trip is within easy reach of Cabo. What awaits after an hour's drive up the Pacific coast is this charming seaside town ringed by mountains that wows with Old Mexico ambience. Shops and art galleries line cobblestone streets, quaint cafés serve up cervezas, and wild waves make it one of Mexico's top spots for surfing. Also known as the Arch of Cabo San Lucas, this distinctive "Land's End" limestone rock formation juts into water that divides the Pacific and the Gulf of California. It's an ideal backdrop for sunset cruises, bird and sea lion sightings, and, for several months a year (notably in February), whale watching. It's not uncommon to see Humpbacks breaching, so be patient with your camera. El Arco is also a popular spot for deep-sea fishing, the activity that put Los Cabos on the map in the first place.